Some of the world’s most talented SF writers collected to throw light on a brighter future. 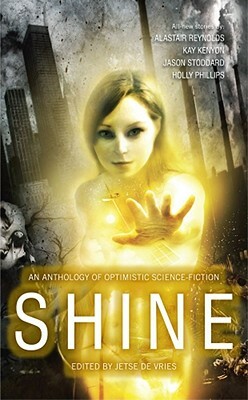 Shine: a collection of gems that throw light on a brighter future. Some of the world’s most talented SF writers (including Alastair Reynolds, Kay Keyon and Jason Stoddard) show how things can change for the better. From gritty polyannas to workable futures, from hard-fought progress to a better tomorrow; heart-warming and mind-expanding stories that will (re-) awaken the optimist in you! Jetse de Vries has been writing SF since 1999 and had his first story published in 2003. He’s been part of the editorial team for renowned SF magazine. Shine is his first anthology.